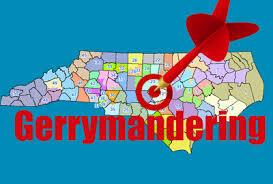 To be precise, 28 of the General Assembly districts drawn by hired gun Tom Hofeller in 2011 were declared an illegal "racial gerrymander," but the Republican leadership itself admits that some 116 districts will have to be redrawn, because, you know, the domino principle. The battle over redistricting is also back in court today in Greensboro federal court, where a three-judge panel will hear arguments about how quickly the redistricting must be done and whether there might still be mandated House and Senate elections this year for those 116 redrawn districts. Doubt that House District 93 (Jonathan Jordan) would be impacted, but Senate District 45 (Deanna Ballard) might be.